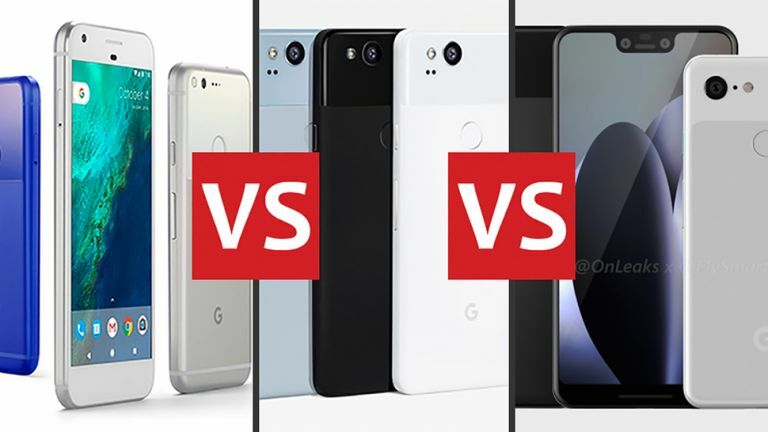 Within the next couple of months we're expecting to see new Pixel phones, and in the spirit of trying to figure out what Google will do next, we thought we'd take a look back at the Pixel phone series so far – the four phones that have launched since October 2016. Two years is a long time in smartphone tech of course, and you might not remember what the very first Pixel and Pixel XL brought to the table. We're here to refresh your memory, and to speculate what the current Pixel phone crop might suggest about the next batch. Cast your mind back to 2016 and Google caused something of a stir: instead of partnering with other companies to make Nexus phones, it was going to start making Pixel phones of its own (though HTC had a pretty big hand in these first two). The result was the Pixel and the Pixel XL, setting the blueprint for the years that would follow – two phones, each very similar in looks and specs, at two different sizes. Google had caught the attention of the smartphone industry again. Of course this was before the iPhone X and before the minimal bezel trend had really taken hold – the bezels on the Pixel and the Pixel XL were very much in evidence, so the phones looked very similar. The main difference was the 5.0-inch, 1080 x 1920 pixel screen on the smaller Pixel and the 5.5-inch, 1440 x 2560 pixel screen on the bigger one. Inside we had a Snapdragon 821 processor, 4GB of RAM, and either 32GB or 128GB of storage, and those specs were identical across both phones. So was the single-lens, 12.3MP rear camera, which straight away gave Pixel phones a reputation for taking some rather excellent photos. The phones didn't have everything though – waterproofing was missing, as was wireless charging. They also cost significantly more than the Nexus phones that preceded them, a sign Google was ready to start competing at the high-end. And so to the 2017 and – for now – current Pixel phones: the Pixel 2 and the Pixel 2 XL. Last year the phones diverged further in terms of design, with the Pixel 2 XL slimming down on the bezels and the Pixel 2 sticking with a more old-fashioned look. The smaller phone stuck with a 5.0-inch screen (1080 x 1920 pixels) last year, though the larger model went all the way up to 6.0 inches (1440 x 2880 pixels), something to cater for those who really like their handset screens tall and wide. As for the other specs, the internals got a bump to a Snapdragon 835, though the 4GB of RAM stayed the same as it did in 2016. The lower storage tier became 64GB rather than 32GB (remember there's no microSD card slot on Pixel phones), while the top storage tier remained the same at 128GB. In terms of megapixels, the single-lens cameras on these phones actually took a drop from their predecessors, down to 12.2 megapixels. However, Google really improved its image processing software, providing low-light and stabilised shooting that's still just about as good as anything else out there. This time IP67 waterproofing and dustproofing added a bit of extra protection, though wireless charging is still absent – perhaps something we're going to see in 2018? So what can we expect this time around? Once again it's rumoured that Google has two phones in the pipeline to cater for different sizes of hand and different budgets – you're going to be able to choose between the Pixel 3 and the Pixel 3 XL. It looks as though the 4th of October will be the date when we see these new phones – a date which matches the launch date from 2016 and 2017 – and Google is being widely tipped to introduce a new smartwatch and a new Pixelbook on the same day. This time around the Pixel XL phone is being tipped to have an iPhone X-style notch, while the standard-sized Pixel makes do with a more conventional look. The two display sizes are apparently 5.4 inches for the Pixel 3 and 6.2 inches for the Pixel 3 XL, so a slight increase on what we saw last year. We're not expecting too many surprises: the new Pixel phones will look similar to their predecessors, and keep the single-lens rear cameras, though the internal specs and the camera quality will get a bump. Android 9 Pie will be on board of course. We're hoping that we get wireless charging and full IP68 waterproofing and dustproofing this time around, though we'll have to wait and see exactly what Google has got planned. There have also been rumours of a mid-range Pixel phone too, but we reckon that two handsets is more likely, based on what Google has done in the past.